Worked on the lift out section (LOS) this past weekend (03/28 - 30/2008). Measured and hot glued the styrene sheet for concrete foundations, pads, and roadways in and around the locomotive service facility LDE. The image to the left shows the attached styrene sheets and drying after it was spray painted with a 1:1 ratio of concrete and aged concrete enamel coating. Once the paint dried a layer of plaster, vermiculite and Portland cement with ground cover latex paint ground material was applied to the exposed areas of the lift out section. I established a foundation base from the styrene sheets for the Allied Rail Rebuilders (ARR) kit, the DPM garage kit, two fuel and oil tanks with concrete pads and then a roadway that runs behind the ARR structure and then in front of the DPM garage kit. The roadway runs up to the Wye track and will continue onto the crossing. A simulated dirt road will run from the paved roadway to the concrete pad that will support the fuel tanks kits. Eventually a chain link fence will be added along with scenery foam for scrubs to hide the gap of the lift out section. This will give a perception that the lift out section is not actually a lift out section. 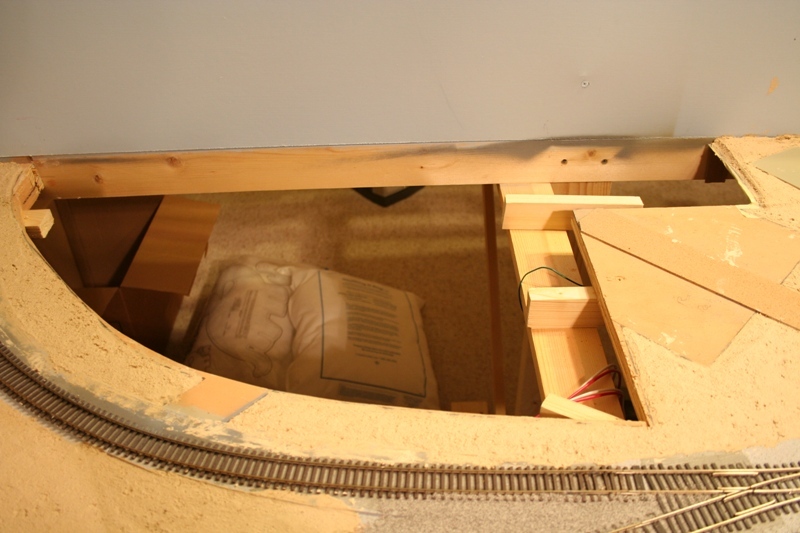 Use of view blocks will aid to hide that it actually can be lift out for access hatch reaching of the back parts of the layout. The image to the left shows the open access hole that the LOS fills. 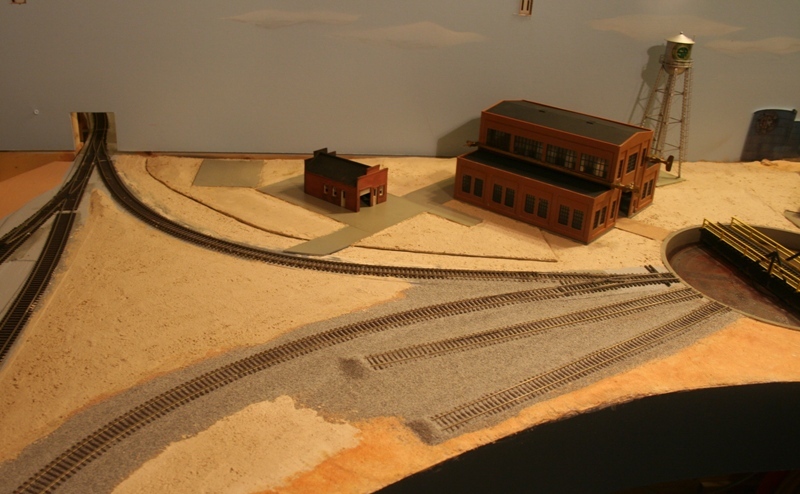 This access allows me to reach the back areas of the layout that are beyond the 3'-4' foot reach. 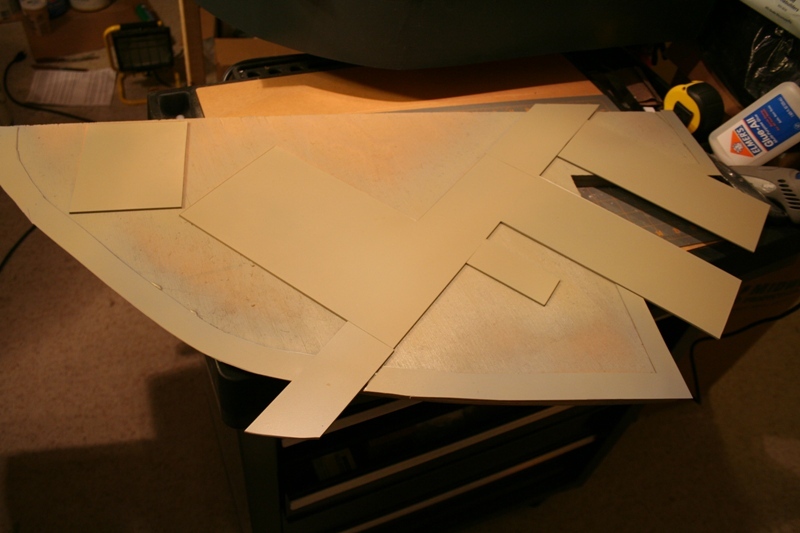 The next image shows the completed area with ground base layer added and the structures in temporary placement.